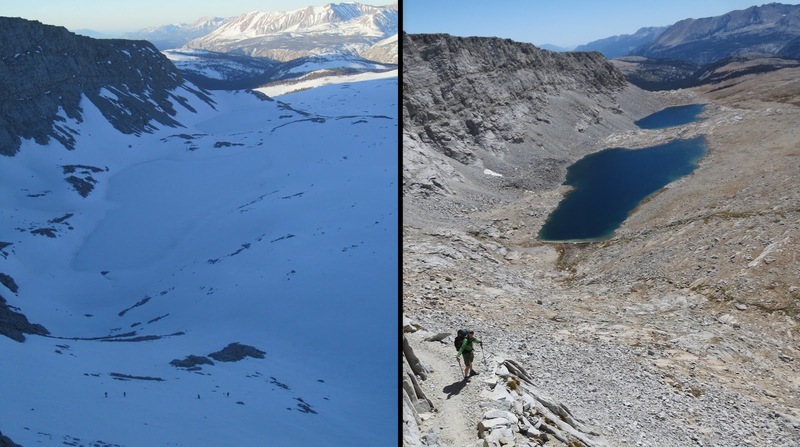 Early season PCT hikers pass through a Sierra Nevada that is a wholly different experience than what the summer backpacker faces. The photos on the left were taken in mid to late June 2011. 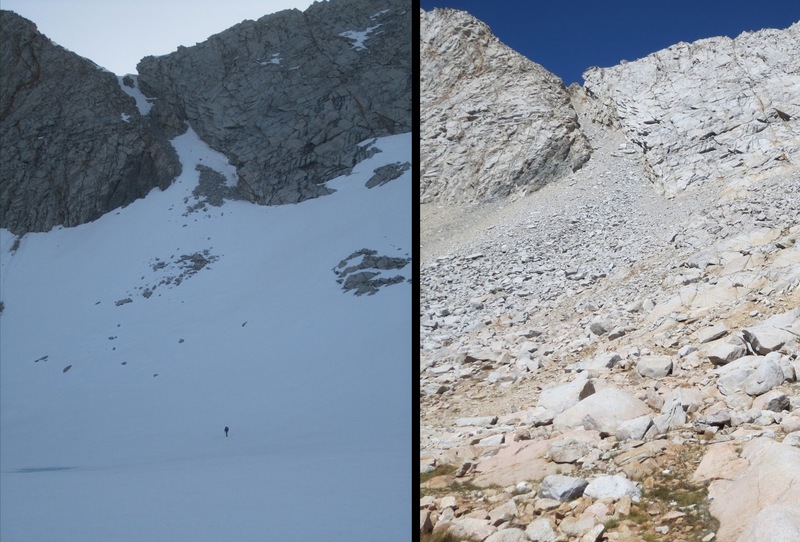 The comparison photos on the right were taken in 2012 and depict typical summer conditions. Take a look. Heavy snow year and early season PCT hikers will face miles of snow travel, light mountaineering and extreme creek crossings. It’s dangerous and people get hurt. Thanks to Class of 2011 thruhiker Wired for most of these excellent comparison photos. Guitar Lake from the slopes of Mt. Whitney. The climb is one of the steeper snow slopes that PCTers may face. Thruhikers fording Tyndall Creek with snow banks on both sides. Thru-hiker ‘Wired‘ at the Lake South America trail junction south of Forester Pass. The south approach to Forester Pass. PCT hikers have had to self arrest after falling while crossing the chute on the south side of Forester Pass. The consequences of a fall could be deadly. Looking south from the top of Forester Pass with Diamond Mesa on the left. Hikers on the north side of Glen Pass. Looking down at Rae Lakes. The south side of Silver Pass. The south side of Mather Pass is one of the most challenging passes when there is snow on the trail. Crampons and ice axes are often a good idea. Ascending Muir Pass from the south. The snow approach in the photo was a fair bit to the west. Muir has many miles of generally low angel snow travel during the early season. Wanda Lake below Mt. Goddard. Sometimes you don’t know where the water ends and land begins. This is branch of Bear Creek is often unsafe during peak melt. Some hikers in past years have gone across this log, others ford or find other dangerous crossing options. The crossing of Bear Creek is notoriously dangerous during high runoff. Hikers have been swept off their feet here. Some choose to cross upstream. It is also dangerous there. Thanks to Drop-N-Roll for the high water photo. During the early season hikers pass through a strong waterfall where normally there is just a small creek. Looking north from Donahue Pass. Lyell Canyon is generally snow free when hikers pass through. Lyell Canyon on the way to Tuolumne Meadows. The PCT is often full of water in the early season.